This is a gorgeous women’s long sleeved top for those casual, but somewhat dressy occasions. 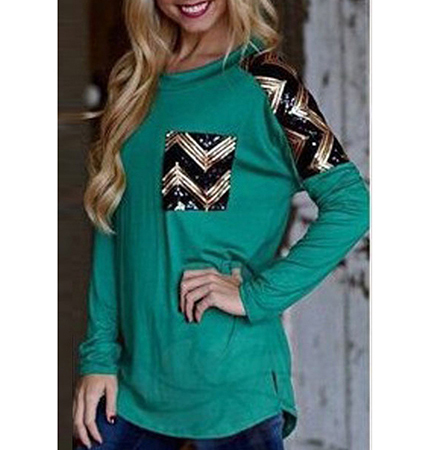 You will love the lovely shade of green with its brilliant metallic inserts in gold and black chevron print across the upper back and sleeves. The front breast pocket matches. This top features a simple round neckline and has long fitted sleeves. The length of this top flatters the figure with a hemline that ends well below the hips. This top looks great with leather pants or jeans. It is available for purchase in sizes Small, Medium, Large and Extra Large.